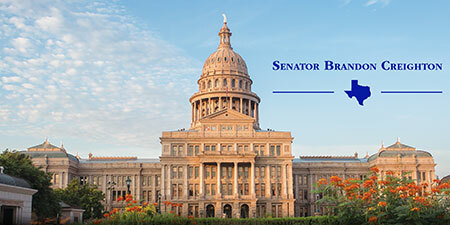 On August 26, 2014, Senator Brandon Creighton was sworn in to the Texas State Senate to represent the citizens of District 4, which encompasses parts of Montgomery, Harris, Chambers, Jefferson and Galveston Counties. 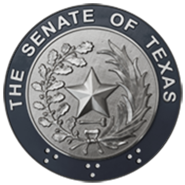 During his tenure as Senator, he has taken the lead on key issues that matter to Texas job creators including franchise and property tax relief, water and transportation infrastructure, and border security. 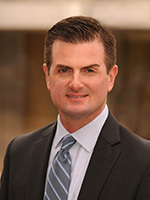 Before election to the Texas Senate, Creighton served as State Representative for District 16 where his peers elected him to Chairman of the Texas House Republican Caucus. He also served as Chairman of House Federalism Committees tasked with overseeing the state’s relationship with the federal government and ensuring that Texas’ constitutional rights are protected. Throughout his legislative career, his priorities have distinguished him as a genuine defender of conservative values. He has relentlessly hammered excessive taxation, pursued “loser pays” tort reform, passed drug testing for unemployment benefits, stood up for Texas’ 10th Amendment rights and effectively blocked Obamacare's Medicaid expansion. Brandon is an eighth-generation Montgomery County resident, where he resides with his family. He is a graduate of the University of Texas and holds his Doctor of Jurisprudence from Oklahoma City University School of Law. In his spare time, he enjoys Texas history, sports, hunting and fishing.